I saw that I had moved right below the mechanical notice board. It had letters that flip into place to indicate the destination of the next train. I watched as the letters for my direction clicked over and spelled out, 'P–O–Z–Z–U–O–L–I'. That was where I was going, so, in spite of whatever other character defects it may have had, this was a good sign, though perhaps a mite optimistic, for time continued to pass, time during which, I feel sure, the Great Red Spot on Jupiter made significant progress across the surface of that kingly sphere, but also a period during which our Metro station remained as unsullied and pristine and as gloriously trainless as the Garden of Eden. My central nervous system was now so bored that it threatened to start answering weird ads in personal columns on its own just for a little action, so I shifted over a bit and casually, unsuspectingly, looked up at the other side of the board, the side that would indicate the destination of trains going the opposite way. It, too, had tiny individual slots for letters, but they were rightfully blank, since there was only one more stop in that direction to the end of the line, Gianturco, which was, however, closed for repairs. A strange thing then happened, something that made my skin crawl. The sight of my skin slithering towards them from the far end of the platform was so repulsive to the other passengers that now they moved farther away from me. Above me on the board, concealed from them, but clear to me, the blank letter spaces had whirred to life and where there should have been nothing, no destination at all, letters had slowly flip–flopped into place and now read: 'NBLKFOPSJON'. It was only there for a few seconds and I was the only one to see it, but I am now convinced that Someone or Something somewhere, for reasons that may never be known, had given me a brief glimpse into The Other Side. For those few short seconds, I, alone, on this planet knew the answer to The Question: Where the Hell is My Damned Train?! It was in NBLKFOPSJON. Everyone's unarrived train is in NBLKFOPSJON! Now it is clear —that is the only place they could ever be! Surely you don't think there is room for all the missing trains in Naples to be hiding out down at the end of the line, maybe catching a quick beer and a smoke or listening to the ball scores, while you cool your heels. They are clearly somewhere else. 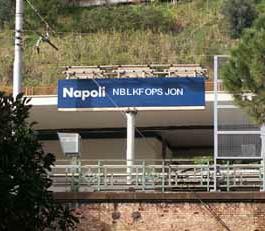 NBLKFOPSJON is a —call it a 'station,' if you will, since our language has no real term for places like this— that lies beyond the end of the line. Perhaps it is a station in a universe parallel to our own, or maybe —I haven't quite got all the details worked out, yet— it is out near those isles of gloom, at the mere mention of which even the bravest mariners in Viking sagas tremble and reach for the glühwein —abodes with names like Fyrlswørth, Llygymmkin, and, yes, Nblkfopsjon. I'm not sure what good this knowledge does me. It is almost masonically arcane; indeed, there must be others out there who "know," and it has occurred to me that maybe we should have some way of making ourselves known to one another—secret handclasps or something. Occasionally I test this out by quite audibly ordering a metro ticket for "Nblkfopsjon" and then quickly checking around me in the line for reactions. I thought I saw a gleam of "knowledge" in the eyes of a young woman the other evening, but when I ran over and tried what I thought was a pretty good secret handclasp on her, she hit me in the nose. So, what have I learned? Maybe this: don't fall asleep on the train.